Hello all, I have a decent amount of experience completing structural projects but really novice in finer woodworking like furniture. I am wanting to get started and wanting to acquire some equipment to assist in this journey. I would like to start building dining tables, coffee tables, TV entertainment centers mostly for favors and gifts for family but maybe if I get good enough do some building to make a little extra money. I have some tools already a compound sliding miter, biscuit jointer, router and router table, jig saw, sander, and a few others. I am thinking about a Planer and I need a table saw. I had the Kobalt table saw from lowes that got me by on a few projects but would like something better now. Space is a big issue only having a small garage that the wife needs to get her vehicle in most of the time. Dewalt DW7480, But I have read this does not allow the user to use a Dado Set. DWE7491RS, The stand is really not needed but can accept a Dado Set. Other items will be considered. My budget for both is no more than $1200. 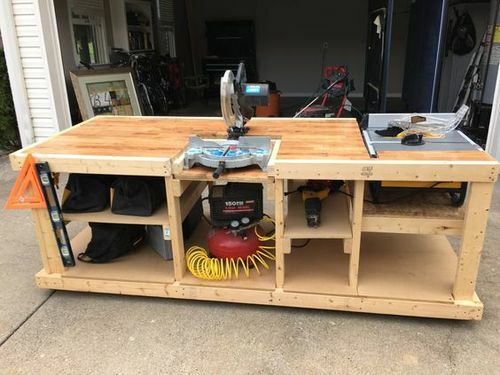 I like the idea of something like a rolling workbench like I have seen online in the interest of saving space and giving me a table to work on. The table saw would be built into the rolling work bench as well as the router table and my miter saw. Ok the rambling will stop now and please help a new person out! Pick a project, buy what you need to build it. Keeps you from buying things that you’ll never use. It’s very easy to get lured into buying tools that you might use once or never. If you want to build furniture, buy a contractor, hybrid, or cabinet saw. Those benchtop models are for guys to throw in the back of the truck and cut 2×4s. The most important part of a tablesaw is the fence and those benchtops have crappy – mediocre fences that are very difficult to upgrade. The jobsite saws have much less working area in front of the blade, are much louder, much lighter, have less torque, are less feasible to fix, harder to add accessories to, and in general just give up a lot compared to a decent full size stationary saw. If you don’t really need portability (the workstation suggests you dont’), I’d make the move to a full size cast iron saw with a belt drive induction motor, and a decent fence….put it on wheels or a mobile base Buy used if budget is the driving factor. Also, while the DW735 is a really nice planer, it’s a lot of money. The DW734 is an excellent way to get the job done and shave a couple hundred dollars off the budget. Pick a project, buy what you need to build it. Keeps you from buying things that you ll never use. It s very easy to get lured into buying tools that you might use once or never. If you want to build furniture, buy a contractor, hybrid, or cabinet saw. Those benchtop models are for guys to throw in the back of the truck and cut 2×4s. The most important part of a tablesaw is the fence and those benchtops have crappy – mediocre fences that are very difficult to upgrade. +1 Yes! Great advice. The man knows of what he speaks. Thanks for the advice so far. Can anyone provide me with some good semi-budget friendly options for a table saw? I have been watching craigslist here in Oklahoma City / Oklahoma area without much luck. Also the Work Station will be on casters so it can be moved around. I like the idea of a large stationary table saw but also like the idea of having a nice sized work bench. There really isn’t much room for both in the shop. Not trying to be difficult your input is very welcome just trying to get across my thought process. Just saw your CL links. I’ll do some looking that those. Thanks! Those contractor type saws can be taken off their stands and mounted in a workbench pretty easily… so if you don’t want them stand alone, you don’t have to have them that way. The only issue is the motor hanging out the back, so you would need to plan for that. You can usually find them in the $100-$200 range on the used market pretty easily, or even cheaper if you are patient. That leaves a lot left in your budget for plenty of other stuff. Just saw your CL links. I ll do some looking that those. Thanks! i have had that saw for 12 years now. same fence,too. ive done a lot of work with it and its been an excellent saw. the only thing i would like with it is more rip capacity. 30” is good, but theres a few times when working with plywood id like more capacity. i got mine brand new for $400. since the add says OBO, id start $100 lower. You should definitely be able to get a Jet or Delta used contractor saw for around $400. Maybe a bit more it it has an upgraded fence. I have had my Jet contractor saw for about 14 years now. Never had a problem with it, except that it is time for me to start looking for a cabinet style saw, but that may wait a couple more years. WRT a planer, you can’t go wrong with the Dewalt 735x. I have one, and it is great. Beautiful results straight out of the box. The shelix head looks to be a great upgrade, but I haven’t even needed to change my stock blades in the year I have owned it. One thing you have to consider is a jointer. If you will be purchasing only pre-surfaced material, then you can get by without a jointer (i.e. 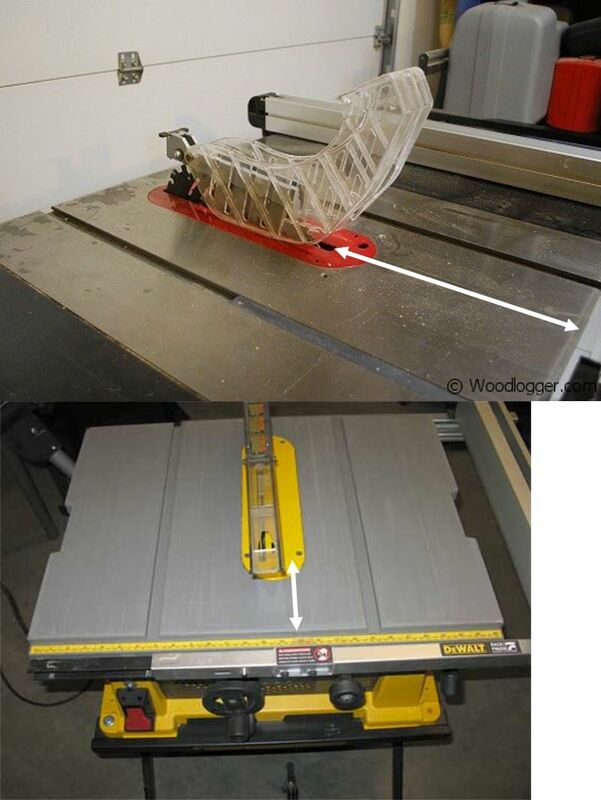 using a table saw, router table, or and-plane to square up your edges). But if you will be working with roughcut stock at all, a jointer will be pretty much mandatory if you wish to flatten your boards. You could do this with hand-planes, but boy is it a lot of work. Another vote for the jointer…I have a DeWalt 735 and it does a fantastic job. For the money you can go wrong. That said, it, like every planer I have ever used, will not take cup out of boards. A nice jointer is much more useful in my opinion. You will be gluing a lot of boards together to make panels so they don’t warp and you can face joint the boards before you glue them up to get the cup and warp out and have nice flat square wood to work with. A planer will make wood to a certain thickness, it will not take out the warp or cup. I have used and liked the DeWalt table saws, they work just fine. The jobsite saws have much less working area in front of the blade…..
Knotscott, could you please tell us what the advantage of having a longer landing zone in front of the blade is? What does this do for you? Thanks for any info!!!!! I would hold off on buying the planner and use that budget to invest in a better table saw. $1200 would get a new Grizzly on a mobile stand. Normally, the planner and jointer go together as set. You can get by with just a planner by using a sled on the planner and a different sled on on the table saw to face rough cut lumber, but it is a major PIA. It also requires a tablesaw with a very good fence. Of course this would limit you to sheet goods and S4S lumber for your projects, but you would have a good foundation (a cabinet tablesaw) to build on. In addition to keeping your hands farther away from the blade, it gives you a lot more area to get the board settled and flush with the table before the board contacts the blade. Getting the board registered against the table and fence should give you better opportunity for ripping accurately. There’s also greater crosscut capacity. I know your new to Ljs, so I thought I might give you a little heads up about Knotscott, he is our resident table saw/blade expert along with other types of equipment, I’m a 30 + year woodworker and when looking for equipment I pay very close attention to what he has to say.What he has said here makes a lot of sense. So I don’t offend anyone, of course, others are knowledgeable too. In addition to keeping your hands farther away from the blade, it gives you a lot more area to get the board settled and flush with the table before the board contacts the blade. Getting the board registered against the table and fence should give you better opportunity for ripping accurately. There s also greater crosscut capacity. Okay, I understand and thank you for taking the time to explain!!!! It is greatly appreciated!! All the tools in the world cannot substitute practical experience / skill. 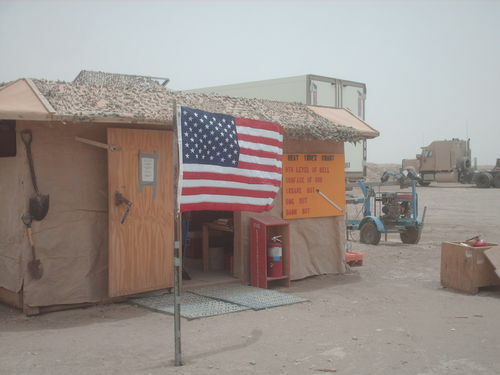 While working in Iraq I had a cordless drill, circular saw, handsaw, file and two screwdrivers. Made furniture from scrap plywood / pallets / or crates I took apart. While I did not have a planer or a sander, sand and some time can be used to smooth rough wood. Did it inside the “shop” pictured below. Point here; work with what you have now. See what tool is needed next or the most and upgrade. Learn to use the new tool. Lots of people buy 5-6K of equipment and a year later it is gathering dust because something did not work or they got discouraged from a few fails.